A DCEU mystery that’s been going on for over three years might have finally been solved, thanks to the plot of James Wan’s Aquaman. Back in February of 2015, Zack Snyder posted an image. It was our first look at Jason Momoa as Aquaman in Warner Bros.’ DCEU and the words super-imposed over him sparked our imaginations. Here’s the original tweet. “Unite the Seven.” What could it mean? The timing is important here. Since this was tweeted not just before Justice League, but a full year before Batman v Superman: Dawn of Justice was released, we had no idea how those stories were going to play out, what heroes would be included, who would cameo, and more. So, most assumed it was a reference to Aquaman’s eventual team-up with his fellow DC heroes. However, since Snyder’s Justice League only ended up having six members (Superman, Batman, Wonder Woman, Aquaman, Cyborg, and Flash), it didn’t play out that way. Most forgot about the bold declaration—but over three years later, we finally know what Snyder was talking about. He was talking about Atlantis. James Wan’s Aquaman is coming out in a few months and while it’s about to make a big splash at San Diego Comic-Con, on a visit to the set Collider heard some details regarding the origins of Atlantis. According to the film, 5,000 years ago, Atlantis fell into the sea and became seven different kingdoms: Trench, Brine, Xebellian, the Fisherman kingdom, the Atlanteans, and a missing kingdom. It seems the villain, Orm (Patrick Wilson) is hoping to “Unite the Seven” in the film and become the ultimate ruler of Atlantis. And so there you have it. Certainly, people in the past three years had guessed at something like this. After all, the idea is clearly inspired by the comics, which in their long history have revealed plenty of other kingdoms under Atlantis’ purview. But to now have an answer to this teaser question feels kind of nice, especially since it suggests Snyder and the team knew the history of Atlantis was something they wanted to tackle in the future. While we wait for that trailer, here’s the official poster. 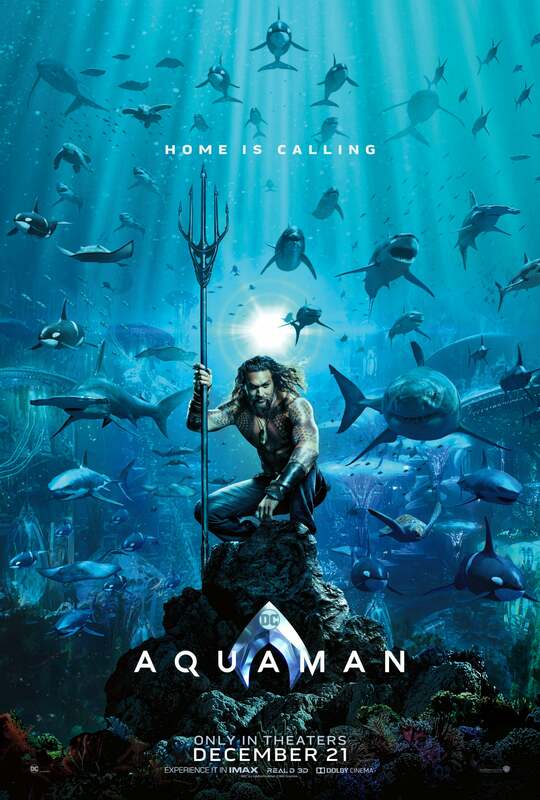 Despite the date on the poster, Aquaman opens in the UK on 14 December, a full week before the US.